Requires RS232 to 1-Wire host adapter. The STP010 temperature probe is designed for general purpose temperature applications. It is constructed of an inner tube of nylon-11 dipped in Humiseal (moisture barrier) then coated in rubber to form a tough outer cover. This makes it durable and water resistant. 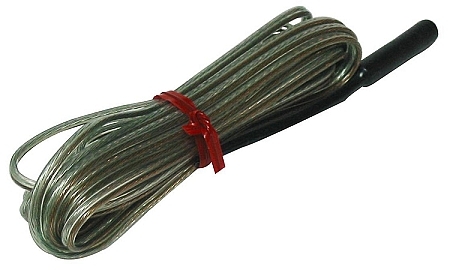 The lead wire is 10' long 22 AWG stranded wire stripped and tinned. The copper lead connects to the Common 'C' and silver lead connects to the Signal 'S' on any EDS 1-Wire PC interface or net expansion product. The probe should not be immersed in liquid, as it is not waterproof. The STP010 is the standard probe shipped with KELVIN™ software/host adapter package available from EDS. It is supported by the OneSix DDE server software from EDS. To connect to a HA3 or HA4 host adapter the copper lead connects to the common or “C” and the silver lead connects to the signal or “S”. To connect to a HA2 host adapter the copper lead connects to the common or “Gold Dot” and the silver lead connects to the signal or “Silver Dot”. *The STP010 uses the Dallas Semiconductor DS1820 chip for temperature measurement. The DS1820 is known to have a temperature drift over time. We have observed a drift of up to +/- 1.66ºC. However, the DS1820 has very good linearity. A one point calibration can bring the product back to the Dallas specification of +/- 0.5ºC.